The poll found that among those who said they were likely to vote in the 2012 election in Kentucky, Tennessee, Virginia and West Virginia, 57 percent were against mountaintop removal and 20 percent supported it. But in the combined region of Eastern Kentucky and southern West Virginia, the results were 41 percent in favor and 47 percent opposed. That was within the error margin of plus or minus 7 percentage points for each of those figures. In Eastern Kentucky, more people favored mountaintop mining, and in southern West Virginia, more people opposed it, but the smaller sample sizes meant there was no clear advantage in those results, either. The above results were for a question that was preceded by a definition saying coal companies “mine coal from mountains through a process called mountaintop removal mining, where the top of a mountain is removed to extract the coal, and waste is disposed in nearby valleys and streams.” Boiled down, the question said waste is put into streams, creating a mental image of unwholesome substances being dumped into creeks and rivers. That is not quite what happens. Small headwater steams, often wet-weather or intermittent, are covered by valley fills made of the rock and dirt mined from the mountains, and the drainage from the fills sends pollution downstream. 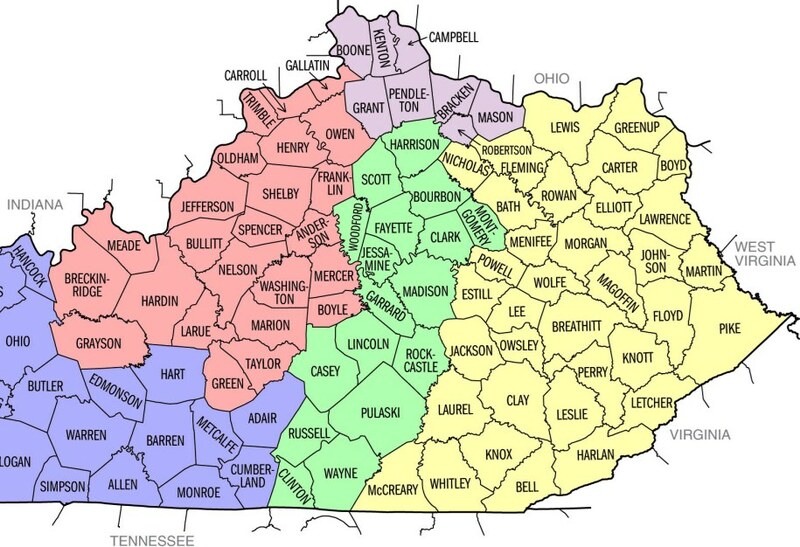 It's impossible to guess how much the definition skewed the results, but a separate group was asked simpler question, which did not define the practice, and they favored it by wide and clear margins, though a fourth of Eastern Kentuckians and a fifth of West Virginians said they didn't know one way or the other. On the more detailed question, the "don't know" group was much smaller. After those questions, both groups were asked differently phrased questions about elected officials who favor strengthening or weakening regulations on mountaintop-removal mining, and about full enforcement and strength of the federal Clean Water Act, which the Environmental Protection Agency is citing in its stricter control of the practice. By clear majorities, voters in the coalfield said they favored full enforcement of the act to protect streams from mountaintop-removal mining, and even said they favored strengthening it to accomplish that. But after two more questions, concluding with an argument and counter-argument about electricity, energy, national security, the economy, environmental regulation, damage to streams and health impacts, including birth defects, 56 percent of voters in the mountaintop-removal region said they favored the practice, while only 31 percent opposed it. Support for it was beyond the margin of error in Eastern Kentucky, at 62 percent to 26 percent but not in southern West Virginia, at 52-35 with a 9-point error margin. Still, the most likely result is that residents of the region favor the controversial practice, as hard as that might be for opponents of it to accept. The poll was sponsored by Earthjustice, the Sierra Club and the Appalachian Mountain Advocates (formerly the Appalachian Center for the Economy and the Environment) and was conducted by Lake Research Partners and Bellwether Research & Consulting July 25-28. 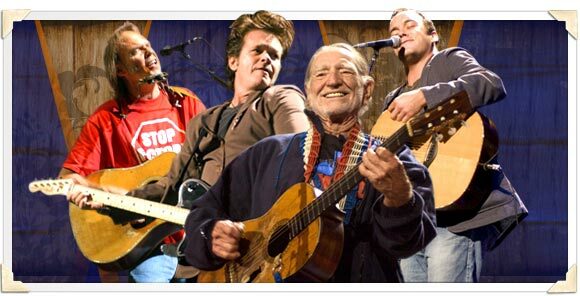 For the groups' press release, headlined "Powerful Opposition to Mountaintop Removal Mining in the Heart of Coal Country," click here. To read the poll for yourself, you can download the 2-megabyte document here. The maps below show the regional boundaries used in the poll results. 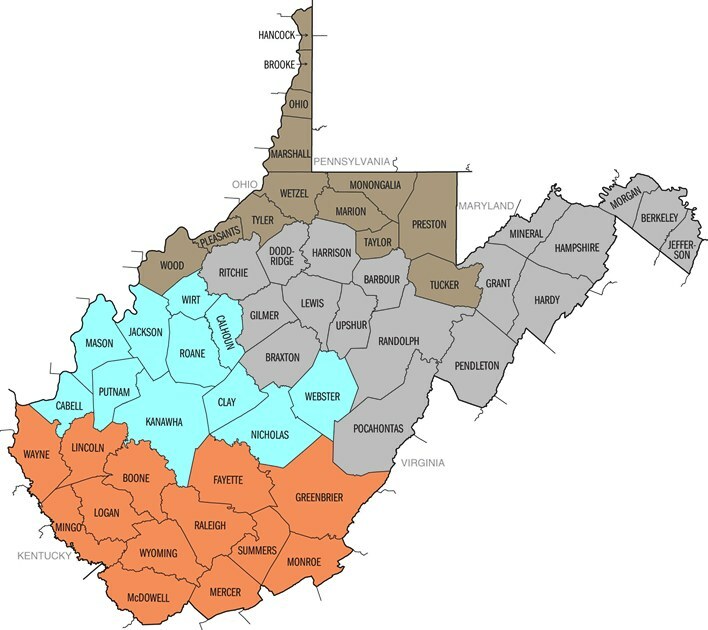 It should be noted that coal mining is more prevalent in southern West Virginia than the region the poll defined as Eastern Kentucky, where some counties have no coal mining and a few have no coal at all. A new report released by the State Collaborative On Reforming Education (SCORE), an education policy group started by former U.S. Sen. Bill Frist, offers specific ideas for improving public education in rural communities in the South. The recommendations are based on research, best practices, and input from rural communities across Tennessee and the rural Southeast. The report is divided into six priorities with specific action items. Some action items include placing teacher trainees in rural schools, expanding virtual education programs, and convincing "philanthropists to put more money into rural districts," The Tennessean reports. To read the entire report, click here. The report was released following the Southeast Regional Rural Education Summit. The U.S. Geological Survey estimates the Marcellus Shale formation underlying most of Central and Northern Appalachia has 84 trillion cubic feet of "undiscovered, technically recoverable natural gas . . . drastically lower than the 410 trillion cubic feet that was published earlier this year by the federal Energy Information Administration," Ian Urbina reports for The New York Times. As a result of the USGS report, EIA plans to reduce its estimate by 80 percent, to match the USGS estimate. "The decision by the agency to lower the estimates comes amid growing scrutiny from Congress about how the administration calculates its numbers and why it depends on outside and industry-tied consultants to produce some of its reports," Urbina writes. "Accurate estimates are important for lawmakers who are making long-term decisions about subsidies and policies relating to the nation’s energy mix. They are also essential for landowners and investors as they decide where and whether to lease their land to drillers or invest in gas companies." The new estimate is of resources, not reserves, which are always smaller because they are based on the ability to extract them profitably. "The geologists also did not discuss how high gas prices will have to rise before companies can make enough money to justify increased drilling," Urbina notes. Presentation is so important during competition that some people cheat. 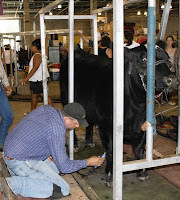 People have been caught drugging bulls with Clembuterol to add muscle and "injecting vegetable oil between their skin and muscle tissue to give them a smoother look," Huffstutter reports. The Environmental Protection Agency is cracking down on concentrated animal feeding operations, and it and and some environmental groups are going after state agencies for lax enforcement against CAFOs. EPA recently issued compliance orders to six in the Midwest and criticized the Georgia Environmental Protection Division and Department of Agriculture for poor oversight. An EPA report claims Georgia's agencies, which it trusts to enforce water-pollution regulations, issued faulty or incomplete inspection reports for almost three-fourths of Georgia's 48 large farms, concluding there is "significant risk that Georgia's CAFO program is failing to protect water quality," Chris Joyner of The Atlanta Journal-Constitution reports. At the behest of telecommunications companies, states have resumed enacting legislation to keep municipalities from offering broadband service to their citizens. With passage of legislation in North Carolina, 19 states have restrictions that make owning and operating broadband networks nearly impossible for cities, Melissa Maynard of Stateline reports. The trend slacked off in recent years, hitting a plateau of 15 states in the middle of the last decade, but has resumed with Republican control of more legislative chambers. North Carolina's new law does not prohibit municipal broadband, but has complex rules that municipals must follow: paying the state an amount equal to what private providers pay in corporate income, sales and use and franchise taxes; and restricting financing to revenues from broadband services, prohibiting the use of other city funds, Maynard reports. Special sections on health are good for community newspapers and their readers. Health-care providers have money for advertising in such sections, and a section focused on health can have more impact on readers than individual, occasional stories. Based on a pilot project it oversaw in 2007, the Institute for Rural Journalism and Community Issues began recommending to rural newspapers that they schedule health sections as part of editions that are mailed to every postal customer in a paper's home county, a standard circulation-building technique. If a newspaper wants to help improve the health of its community, why not reach everyone in the community? Last week, one Kentucky newspaper did that. The Adair County Community Voice of Columbia included a 10-page broadsheet section on health in an edition that was mailed to everyone in the county. And though it got no advertising from the local public hospital, with which it has been embroiled in an open-meetings dispute, it did get ads from hospitals in other counties. Newspapers can mail up to 10 percent of their annual circulation to non-subscribers in their home county at subscriber rates, and can sell "sponsored circulation" to pay the extra cost of printing and postage for the extra copies. The 2007 pilot project with another Kentucky weekly, The Berea Citizen, found that non-subscribers said they were more likely to subscribe if the paper regularly included health information. For a copy of the report on the project, click here. The health section is not online, but PDFs of its pages are posted on the Institute website in a 4.4 MB file, here. "The association that oversees Wisconsin high school sports can limit who streams its games live on the Internet even though most of its member schools are funded by taxpayers, a federal appeals court ruled yesterday," The Associated Press reports. The decision by the Seventh U.S. Circuit Court of Appeals in Chicago "could have First Amendment implications for news-media outlets nationwide." Many rural newspapers have found videostreaming of high-school sports a popular feature that builds traffic and advertising for their websites. "Other athletic associations and newspaper groups have been closely watching the Wisconsin case, and the decision could lead to litigation in other states," AP notes. The court ruled that the Wisconsin Interscholastic Athletic Association can grant exclusive rights for live streaming of its tournaments. The WIAA "said it couldn’t survive without being able to raise money by signing exclusive contracts with a single video-production company for streaming its tournaments," AP reports. It won at the trial-court level, and unanimously among a three-judge panel of the appellate court. Critical-access hospitals will get help recruiting physicians to their rural areas through an expanded loan repayment program that is part of President Obama's new jobs initiative for rural America. The initiative is called the National Health Service Corps, Alexandra Wilson Pecci of HealthLeaders Media reports. The 1,300 critical-access hospitals can use federal loans to recruit new physicians. A press release from the White House states the addition of one primary care physician in a rural community generates about $1.5 million in annual revenue and creates 23 jobs annually. 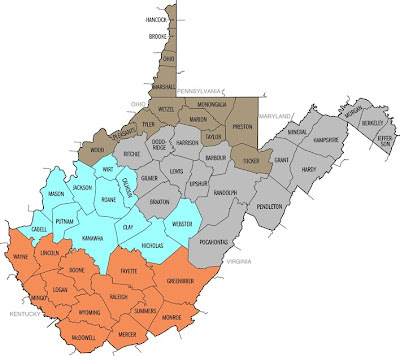 Critical-access hospitals must be in rural areas, 35 miles from another hospital or 15 miles from another hospital in mountainous terrain, according to the Rural Assistance Center. The average CAH creates 107 jobs and generates $4.8 million in payroll annually, the White House says. The jobs program also includes an agreement that will "link rural hospitals and clinicians to existing capital loan programs to help them buy health IT software and hardware and jump the typical rural hospital hurdle of limited access to capital and lower financial operating margins," HealthLeaders Media reports. A few days before announcing the jobs program, the White House Rural Council released a report that outlined recent investments in rural healthcare access. Those include placing more than 2,600 clinicians in rural communities and providing distance learning and telemedicine services to more than 2,500 rural healthcare and educational facilities. It also highlighted an investment of 500 projects across the U.S. Department of Veterans Affairs health care system that support rural health care. That includes 404 community-based outpatient clinics and 48 outreach clinics in rural areas. The rare earthquake that rattled the Eastern U.S. Tuesday was felt by some and not by others, but cats seemed to get a hint of it in advance, according to news reports in the rural mid-Ohio Valley (southeast Ohio and west-central West Virginia). A staffer at the West Virginia University extension office in Parkersburg, W.Va., told the News & Sentinel newspaper, "I thought my world was coming to an end. ... Everything was shaking, our chairs moved and other things moved." Another local person was taking a late lunch in the highlands just southeast of the city center, and said, "
I was up on Blennerhassett Heights and didn't feel a thing." A geology teacher at Marietta College, just upriver from Parkersburg on the Ohio side, told the paper that whether someone felt the quake depended on the geology under their particular building. "It's a function of the geologic material under a building," geologist Wendy Bartlett said. "Most of Marietta is built above bedrock, so the quake would be felt less than in an area like Parkersburg that's mostly located over floodplain material." Blogger Paxus Calta, who lives in the Twin Oaks community just five miles southwest of the quake's epicenter of Mineral, Va., in Louisa County (Wikipedia map), writes: "I have lived in San Francisco and Santa Cruz for almost 10 years and this was the wildest ride I have had. The community rallies in these types of circumstances. We form effective little committees, the first of which went around and made sure all the members were accounted for and that everyone was okay." The Central Virginian, the weekly newspaper in the county seat of Louisa, reports that schools in the county "are closed until after Labor Day to assess damage sustained at each school." The paper paraphrased Dominion Power officials as saying "that the two reactors at North Anna Power Station have been safely shut down. In March, they cited the earthquake rating of the plant at approximately 6.0." The quake was rated at 5.8 or 5.9. 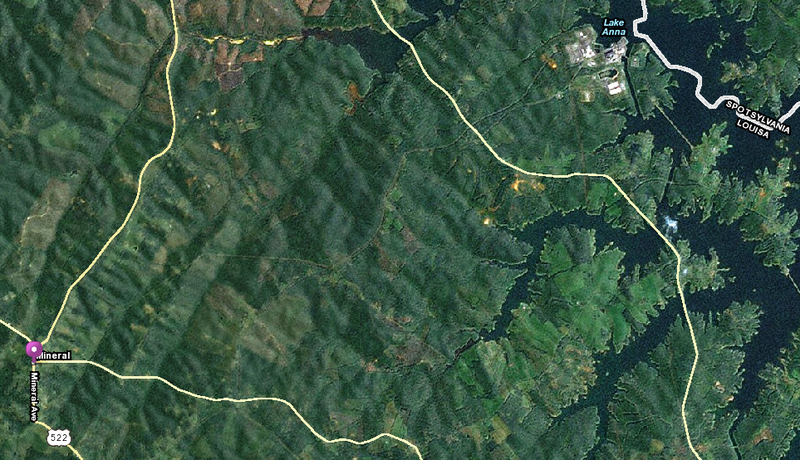 The nuclear facility (at upper right of MapQuest image) was built in conjunction with the impoundment of Lake Anna. 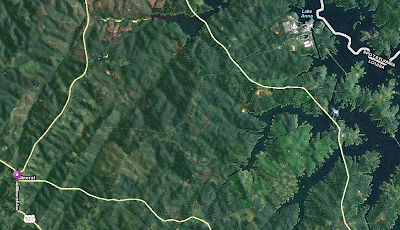 It is about five miles from the epicenter near Mineral (purple pin on map; click on map for larger version). UPDATE, Sept. 1: Reuters reports the quake rattled and moved nuclear-waste containers at the plant, recalling warnings that environmental groups made when the plant was proposed in the late 1960s, Peter Galuszka of the Bacon's Rebellion blog writes on The Washington Post's website. Many rural advocates have bemoaned the shortage of philanthropy in rural America. The U.S. Department of Agriculture and the Council on Foundations recently signed a memorandum of understanding to encourage economic growth in rural America through creation of new sources of capital, job opportunities, workforce investment strategies, and additional resources, the USDA announced in a release. USDA and the council will survey existing economic opportunities, link complementary resources and coordinate common agendas, in an effort to improve the quality of life in rural America by providing basic services and giving businesses the tools necessary to compete and create jobs. "While the government can provide critical assistance," Agriculture Secretary Tom Vilsack said in a speech to philanthropists last month, "more can be done if the government more effectively partners with the philanthropic community and the private sector." Greer's decision upheld a decade-old precedent regarding class-action lawsuits, set in the landmark case between cattle growers and a meatpacker. The precedent says class actions cannot proceed when some members of the class "benefit from the same acts alleged to be harmful to other members," Agri-Pulse reports. 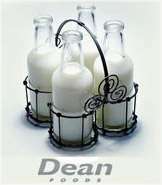 While the Dean Foods case is currently unsettled – scheduled to go to trial Sept. 13 – Greer's "ruling is an important vindication for the notion that it's legitimate to have a full-requirements contract in the dairy industry or a formal contract for hogs or cattle even if some farmers won't, or can't meet the terms of the agreements and don't benefit," Agri-Pulse reports. 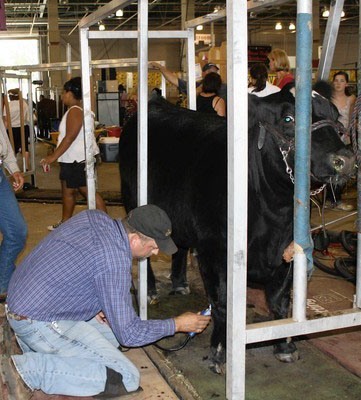 The ruling may also show why Department of Justice anti-trust lawyers have been criticized for their lack of action against consolidation and integration of the livestock and meatpacking industries following last year's nationwide public hearings. The Department of Agriculture's proposal to more closely regulate livestock and poultry marketing to protect small farmers is facing opposition from growers who support similar contract arrangements that will become more difficult with government involvement. USDA support of organic and small farms generates controversy, as some see "the administration as favoring" these farmers when policy disagreements arise with conventional and commerical-scale producers, reports Agri-Pulse, a Washington newsletter that is subscription-only but offers a four-week trial subscription. Electronic emergency services are bridging the gap between understaffed rural hospitals and specialist-saturated urban centers. One example is St. Michael's Hospital Avera, a 25-bed critical access hospital in Tyndall, S.D. It is one of about 60 rural hospitals that has signed up with Avera e-Emergency Services, a hospital-based telemedicine emergency support service. From its operations hub in Sioux Falls, Avera emergency physicians like Dr. Brian Skow, right, and emergency-trained nurses help rural providers 24 hours a day, The Rural Assistance Center's Candi Helseth reports. They do everything from offer treatment advice to initiate diagnostic testing. "I didn't have any idea this existed," patient Leonard Hajek said. "The nurse pushed a button and just like that this doctor is on a TV screen talking to me." 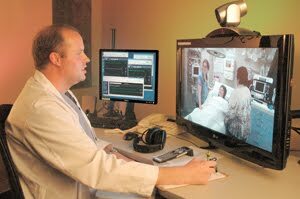 The technology seems to be paying big dividends in patient care. It has reduced patient length of stay, patient transfers to tertiary-care hospitals and has saved money. In Northern California, Sutter Health, the first health-care organization to connect a rural hospital to an electronic ICU, has likewise seen improvements in patient outcomes. "Deaths related to sepsis have decreased 28 percent system-wide and ICU patients' lengths of stay have decreased by 15 percent from 2007 to 2010," Helseth reports. Rural physicians also appreciate the extra help and having access to a second opinion. "It means there is another doctor instantly available who I can consult and who is going to be helping if I need it. It makes me feel like I'm not as isolated practicing here," said Dr. Jill Kruse, family medicine physician at St. Michael's Hospital. The U.S. Postal Service has spared 25 Alaska post offices from closure, at least for now, removing them from the list of more than 3,500 that may be shut this year as part of the service's effort to reduce its multi-billion-dollar deficits. The move doesn't necessarily offer hope for threatened post offices in other states, because, as is so often true, Alaska is a special case. All 25 spared offices are off the road system, reports Andrew Sheeler of the Fairbanks News-Miner. Another 11 in the state remain on the list. Concern over the economy has risen to the point that it calls for commentary and background in news outlets that usually focus on local matters. One of the best servcies these outlets can perform is to get past the partisan and ideological arguments and offer a reliable set of facts (or at least the consensus of expert opinions) for readers, listeners and viewers. The nonprofit, nonpartisan, investigative news service ProPublica did that last week, laying out a series of "economic myths" and giving the contrary facts. For example, the percentage of income taken by taxes has been going down lately, not up; the stimulus package did not fail, but it fell short of its goals, and more than a third of it came in tax cuts. Read more and share. Obama doesn't need "the traditionally conservative rural vote," Phillip Hayes, a former Senate agriculture subcommittee staff director, writes for Politico. "He only needs to keep Republican support low enough that the traditionally left-leaning urban vote can put him over the top." "Obama did better in rural America in 2008 than any Democratic presidential candidate since Bill Clinton," veteran farm journalist Jerry Hagstrom writes for Ag Week. "That was because Sen. John McCain, R-Ariz., the Republican candidate, had opposed both the Farm Bill and ethanol [subsidies] and because the Obama campaign focused more on rural America than most Democratic candidates have." Hayes says Obama borrowed a page from George W. Bush's 2000 playbook by forming "a team of agricultural advisers from the farming community to monitor the heartland’s pulse." (Read more) That was evident last week, at meetings that featured groups representing "smaller farmers, minority farmers and other rural Americans who are more likely to vote Democratic than Republican," Hagstrom writes. "The White House said that 125 rural leaders had been invited to the forum and that 26 states were represented." Hagstrom's 2,342-word report is a good summary of the tour, during which Obama repeated his support for a cap on farm subsidies. "Caps are not popular with the large farmers who produce most of the nation’s food, but they are popular with small farmers who think that the subsidies help the big farmers expand and compete unfairly for land," Hagstrom notes. 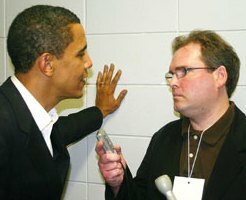 Our favorite report from the tour was Obama's interview with Doug Burns of the Daily Times Herald in Carroll, Iowa. 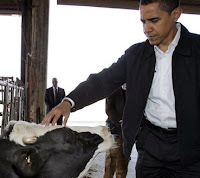 The two became acquainted (2007 photo) during Obama's caucus campaign, in which he targeted rural newspapers, and that shows in the interview transcript. Environmental Protection Agency officials met with leaders and other residents of four Eastern Kentucky communities last week to discuss the environmental impact of coal mining on their communities. Residents and leaders voiced concerns about water quality, air pollution and economic conditions, but the coal industry supporters criticized what the agency called an "environmental justice" trip, calling it "one-sided and anti-coal", Erica Peterson of WFPL Radio in Louisville reports. Stanley Sturgill, a Lynch City Council member and former federal mine inspector, told the officials from EPA Region 4 in Atlanta, "If you're concerned, you're branded that you're against coal, any way, shape, form or fashion. We have tried to get that point across – we're not. We're strictly against surface mining; we're for underground mining." For more from Anders Eld of the Harlan Daily Enterprise, click here. U.S. Rep. Hal Rogers, R-Somerset, and Charles Baird, chairman of Pikeville-based Coal Operators and Associates, were among those criticizing EPA for its lack of notice. The officials offered to meet with industry representatives for an hour on Friday, "but many members of the mining industry were at a conference in Lexington," Peterson reports. To read statements from industry supporters, via a story from WYMT-TV in Hazard, click here. 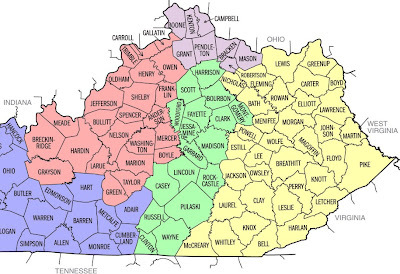 For a reply from Kentuckians for the Commonwealth, go here. For a Lexington Herald-Leader editorial, here.